Those conflagration thermal plumes can be expected to be oxygen depleted. Jets flying through them might stall if their mixture control computers can't compensate and keep up a functional stoichiometric ratio. Care should be taken to fly higher than all risks. Beware of an unstable thermocline. Crafted sound extinguishes fires. A short list of references is added at the end. Almost everyone has seen video of oil well fires put out with a small dynamite blast. I thought of this, because it could be tried immediately, instead of in weeks for the alternative I'm working on. So take note, Ask the FAA, Forest Service, Air Force, aircraft manufacturers and others. Get reruns of Russia's supersonic bombers dumping phos chek into the backyards of homes they are trying to save. It couldn't hurt to fill the boom with a bomb load of fire suppressant. DARPA might want in the loop, but experiments shouldn't wait a year for them. All that burning forest includes a lot of the usual byproduct of water. further isolating fuel from air, wetting and cooling forest fuel. and emergency stops for pre-burns or trapped vehicles and homes. seems small, but I've been up for days, double-check please. Thus the speed of sound increases with the stiffness (the resistance of an elastic body to deformation by an applied force) of the material, and decreases with the density. For ideal gases the bulk modulus K is simply the gas pressure multiplied by the dimensionless adiabatic index, which is about 1.4 for air under normal conditions of pressure and temperature. is the density and the derivative is taken adiabatically, that is, at constant entropy s.
In a non-dispersive medium, sound speed is independent of sound frequency, so the speeds of energy transport and sound propagation are the same for all frequencies. Air, a mixture of oxygen and nitrogen, constitutes a non-dispersive medium. However, air does contain a small amount of CO2 which is a dispersive medium, and causes dispersion to air at ultrasonic frequencies (> 28 kHz). Density and pressure decrease smoothly with altitude, but temperature (red) does not. 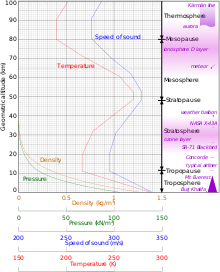 The speed of sound (blue) depends only on the complicated temperature variation at altitude and can be calculated from it, since isolated density and pressure effects on sound speed cancel each other. Speed of sound increases with height in two regions of the stratosphere and thermosphere, due to heating effects in these regions. In the Earth's atmosphere, the chief factor affecting the speed of sound is the temperature. For a given ideal gas with constant heat capacity and composition, sound speed is dependent solely upon temperature; see Details below. In such an ideal case, the effects of decreased density and decreased pressure of altitude cancel each other out, save for the residual effect of temperature. Since temperature (and thus the speed of sound) decreases with increasing altitude up to 11 km, sound is refracted upward, away from listeners on the ground, creating an acoustic shadow at some distance from the source. The decrease of the sound speed with height is referred to as a negative sound speed gradient. However, there are variations in this trend above 11 km. In particular, in the stratosphere above about 20 km, the speed of sound increases with height, due to an increase in temperature from heating within the ozone layer. This produces a positive sound speed gradient in this region. Still another region of positive gradient occurs at very high altitudes, in the aptly-named thermosphere above 90 km. where is the temperature in degrees Celsius (°C). The value of 331.3 m/s, which represents the speed at 0 °C (or 273.15 K), is based on theoretical (and some measured) values of the heat capacity ratio, , as well as on the fact that at 1 atm real air is very well described by the ideal gas approximation. Commonly found values for the speed of sound at 0 °C may vary from 331.2 to 331.6 due to the assumptions made when it is calculated. If ideal gas is assumed to be 7/5 = 1.4 exactly, the 0 °C speed is calculated (see section below) to be 331.3 m/s, the coefficient used above. This equation is correct to a much wider temperature range, but still depends on the approximation of heat capacity ratio being independent of temperature, and for this reason will fail, particularly at higher temperatures. It gives good predictions in relatively dry, cold, low pressure conditions, such as the Earth's stratosphere. The equation fails at extremely low pressures and short wavelengths, due to dependence on the assumption that the wavelength of the sound in the gas is much longer than the average mean free path between gas molecule collisions. A derivation of these equations will be given in the following section. The speed of sound varies with temperature. Since temperature and sound velocity normally decrease with increasing altitude, sound is refracted upward, away from listeners on the ground, creating an acoustic shadow at some distance from the source. Wind shear of 4 m·s−1·km−1 can produce refraction equal to a typical temperature lapse rate of 7.5 °C/km. Higher values of wind gradient will refract sound downward toward the surface in the downwind direction, eliminating the acoustic shadow on the downwind side. This will increase the audibility of sounds downwind. This downwind refraction effect occurs because there is a wind gradient; the sound is not being carried along by the wind. = expected wind gradient at height . If it works, no water re-loading will be needed to slow the effort..
supersonic jet booms spaced for optimum frequency matching. Someday, adjust dive for best explosive decompression. height AGL above all possible wind/shear updrafts/down drafts. Sea level speed of sound Mach 1, (m/s). In dry air at 20 °C, the speed of sound is 343.2 metres per second (1,126 ft/s). This is 1,236 kilometres per hour (768 mph; 667 kn), or a kilometre in 2.914 s or a mile in 4.689 s.
It is proportional to the square root of the absolute temperature, but is independent of pressure or density for a given ideal gas. A duo of undergraduates at George Mason University in Virginia created a device that they say puts out fires with nothing but sound. fire extinguisher based solely on sound waves. Two engineering students from George Mason University, Virginia, have invented a fire extinguisher that uses low frequency sound waves to put out fires. The Sound-Blasting Fire Extinguisher is a portable device that uses low-frequency sound waves to put out flames. A pair of engineering students created a new type of fire extinguisher that uses sound waves to put out flames. The most popular site for professional sound effects in the world. : extinguisher sounds.